Kicking Television (Photo credit: dhammza). In the early years of the 21st century, an interesting phenomenon occurred: the two-screen viewing — which is watching TV on one screen while using another — a laptop, smartphone, or tablet. In my case, it is usually my iPad. In prior decades, watching television was a passive experience, where you would sit and absorb whatever entertainment you chose to tune in to. The only active part was using the remote. That has all changed, and, in my opinion, for the better. My wife uses her iPhone to look up the Internet Movie Database entries on actors, directors, and movies while we watch. Another friend of mine tweets his reactions as he watches various shows and movies. I tend to sporadically do a bit of both. 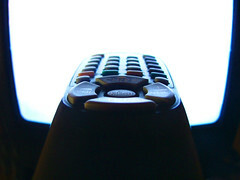 In addition to this passive viewing disruption, the use of social media in connection with TV content is also bringing an abundance of other changes to television viewing. A new report on from Business Insider suggests that this content-linked conversation online is becoming so big so fast that social TV may become a major business on its own. The TV content industry is battling between cable companies, broadcast networks and online upstarts to create new TV viewing options to occupy more of our leisure time. There’s a lot at stake: $350 billion was spent on TV ads globally in 2012. If social TV can help make that advertising more effective, or help social media skim some of those dollars, the opportunity is there for social TV to become a major business in its own right. Social TV is already here: It’s already an established habit with audiences around the world, with majorities of social media users saying they routinely comment about TV shows or events. activity has grown hand-in-hand with the mobile explosion. Smartphones and tablets have made it much more convenient for people to comment on TV, even as they watch it. Forty percent or more of U.S. mobile audiences browsed social media on their tablets or smartphones while watching TV. For smartphone users, social media is a more popular companion activity during TV-watching than shopping. It’s funny how dollar signs always seem to make numbers more interesting, isn’t it? For those who have been paying attention, online video content has always been hot. YouTube is second only to parent company Google when it comes to search. Videoconference tools have become common and mostly free (Skype, Google+ Hangouts, Oovoo, etc.). Some of the recent changes that amplify this effect include Apple’s ability to “throw” your content from iPad or iPhone to your TV. Meanwhile, online-only content providers like Aereo, Netflix, and Amazon Prime continue to tap into the cable TV audience. Socially connected TV viewing, two-screen viewing, social TV — no matter which name catches on — the concept is the same, and it indicates a substantial shift. What about you? How social has your viewing become? Let us know in the comments below!